So I was looking through character dossiers to see who I could mesh well with, and I found Sylvia. No last name, only Sylvia. She seemed nice- a black widow, a reporter, and a fellow admirer of red lipstick. I then saw this 3.5 star assignment, and it was simply calling my name. What could be more magazine-worthy than good young ladies suddenly turning naughty? I found this TIME magazine from the 50s and this hot lady to use as my images. First, I put the magazine into GIMP and set it as the alpha channel. Then, I covered up the original text and inserted my own. I thought that these lines would be eye-catching and a bit ironic, as TIME is a respected magazine and wouldn’t publish something so clickbaity. Right? Then, I put Gene Tierney’s image on top of Winston Churchill in a new layer. I resized and cropped it to fit. 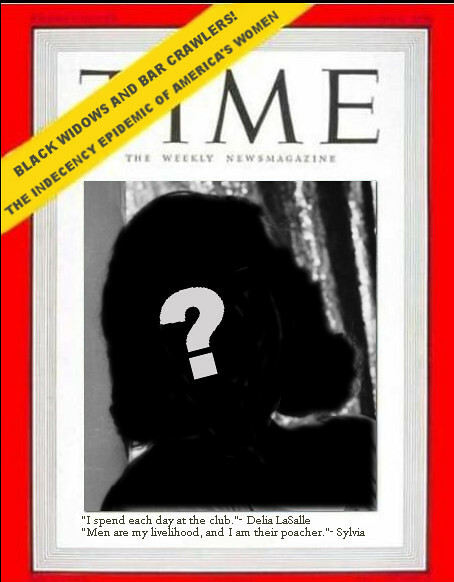 Then, I made a new layer and used the scissor select to black out her face and put a question mark on. This is another clickbait strategy, as it causes curiosity. We’ve all seen those 10 WAYS HE SAYS I LOVE YOU- YOU WON’T BELIEVE #8! slideshows. I’m pleased with how this assignment turned out. I do see some issues in the details, such as the difference in image quality between the old text and the new, but I don’t know how I could change that. If anyone has criticism, please go for it. I’m all ears. Nice Design. Clean, colorful, simple… I like!